c3 : DEMONSTRATE TO SUPPORT ARTISTS RIGHTS ! This action is sponsored by the c3, the Content Creators Coalition, a non-profit organization dedicated to the achievement of economic justice in the digital domain. 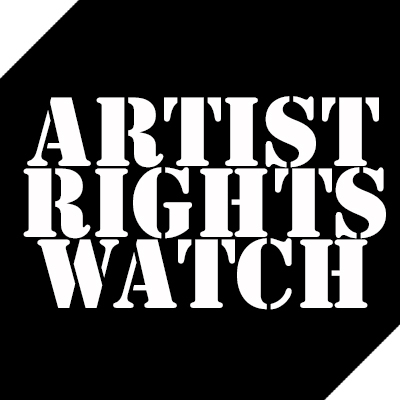 * Google: Stop the Attack on Artists’ Rights. * Google/YouTube: Pay Creators For All Use Of Copyrighted Materials: When Profit Is Being Made, The Artist Must Be Paid: Support An Artists Right To Choose: Take-Down-Means-Stay-Down! * Google: Stop brokering ads to corporate black market sites. Featuring John Zorn, Eric Slick (Dr Dog), Steve Coleman, Marc Ribot, Henry Grimes, Marina Rosenfeld, Trevor Dunn, Brandon Seabrook, Satomi Matsuzaki (Deerhoof), Amir ElSaffar, and more! The event will also feature a short screening of highlights from Michael Count Eldridge’s upcoming documentary film “Unsound”. We’re organizing to fight back. We’re going to give value to the ineffable, uncountable and immeasurable beauty being destroyed. We’re going to give voice to the creators whose work — and lives — are being devalued by tech-corporate greed. We’re going to fight for the sustainability of the culture we all enjoy. We don’t have the lobbying millions of the tech-corporate giants, but we’re going to win. Because the truth is a powerful slingshot. 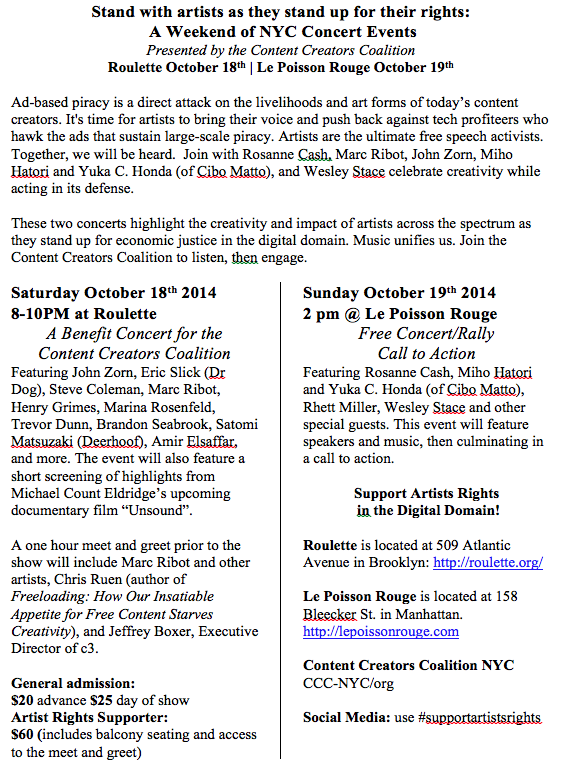 Editor’s note: If you’re in the New York area, by all means go to “Benefit for Content Creators Coalition (c3): Defend Artists’ Rights: Economic Justice in the Digital Domain!” on Saturday, October 18, 2014 at Roulette. The show features: John Zorn, Eric Slick (Dr. Dog), Steve Coleman, Marc Ribot, Henry Grimes, Marina Rosenfeld, Trevor Dunn, Brandon Seabrook, Satomi Matsuzaki (Deerhoof), Amir ElSaffar and more. You can buy tickets here. c3, The Content Creators Coalition is enlisting musicians and songwriters to share their true stories of Spotify plays, payments and thoughts to raise awareness around unsustainable digital service royalty structures. Join in. We do believe in digital. But current rates are not sustainable. 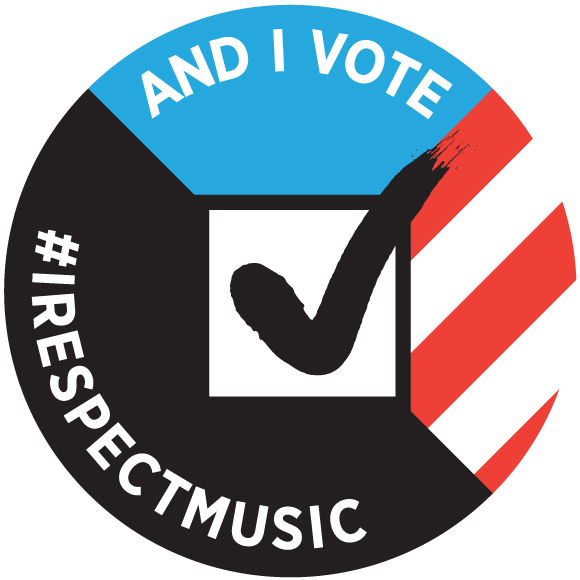 Spotify is using our music like venture capital and promising better returns later while they pay their employees and hire expensive ad firms to create the above hashtag campaign.